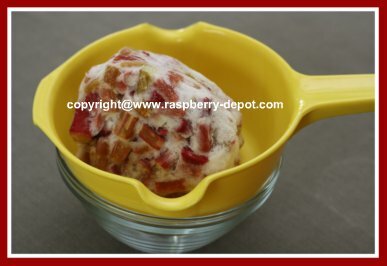 Wondering about making a recipe with frozen rhubarb? 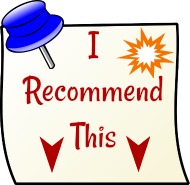 I often receive emails from website visitors who ask if they can substitute frozen rhubarb for fresh rhubarb in all rhubarb recipes. Most rhubarb recipes which require fresh rhubarb in the ingredient list can be substituted with rhubarb from the freezer. That's good news, because, if you are like me, you have a lot of frozen rhubarb in your freezer! 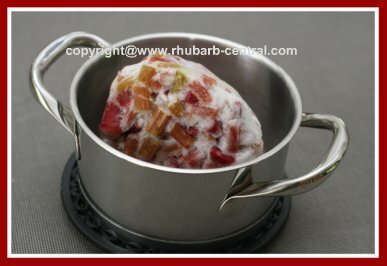 When making a rhubarb stew, or stewing the rhubarb for a particular recipe, for example a rhubarb punch, or a rhubarb drink, you can use the rhubarb frozen. 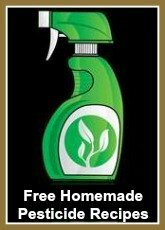 If using it frozen, that is without thawing it first, reduce or eliminate the addition of any water listed in the recipe ingredients and directions. There is plenty of water in the rhubarb which has been frozen, and adding more will make the recipe too watery. 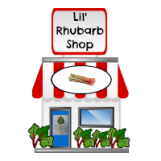 When making most other recipes, such as a rhubarb cake, rhubarb muffins, rhubarb bread, rhubarb crumble, rhubarb squares, and so on, it is advisable to thaw the rhubarb prior to preparing the recipe. You will notice that, after the rhubarb has thawed, that it will appear to have "shrunk". This is because the thawed rhubarb is wetter, (more dense), than the same rhubarb was in the "fresh" stage. When measured in a measuring cup, there is no "spaces" between the thawed, chopped rhubarb. I usually thaw a little extra rhubarb to make up for this. For example, if the recipe calls for 3 cups of fresh rhubarb, I will thaw about 4 cups of rhubarb that is frozen. An approximation of the rhubarb measurement is fine. So, find your rhubarb from the freezer and start making some scrumptious, healthy rhubarb recipes! The sky is (almost) the limit of what you can make with frozen rhubarb! Rhubarb is not only the easiest vegetable to grow, it is also the most versatile vegetable there is when it comes to recipe ideas for baking and cooking with this amazing food!